Let’s focus on this for a minute… Free spirits, such as myself, attest often that “they want their freedom” to do what they desire and go where they want. In the context of improving yourself, however, freedom can become a kind of prison that you have to break out of. If you don’t force yourself to gain more self discipline, you will not gain control over your weaknesses for such things as overeating, alcoholism, drug use – including marijuana consumption and more dangerous addictions. And if you don’t break out of this prison of “freedom,” eventually something else will force you to be more disciplined. What other force could do that? A trip to the hospital, a doctor’s stern diagnosis, ongoing health issues that make it ESSENTIAL to gain more discipline or lose more control over your life. Personally, I think I’d rather gain more self discipline NOW. What a great article on self discipline, huh?! It’s interesting to see the battle that goes on inside my head when a bag of chip presents itself is more of a battle between my body and my soul. Which will ultimately win? How is my renewed dedication to Health going? I am feeling significantly better physically than I was a month ago. I HAVE been preparing more meals in the kitchen and taking them, on average, two to three days a week to school. I can make most of my menu items without looking at the recipes anymore, so you know I’m making this a solid habit. I go shopping for my ingredients on Sunday with Grandma. Then, I come home and start making the egg white bites. As they are cooking in the big oven, I put the salmon and asparagus in the toaster oven to bake. After that, I steam some potatoes, broccoli, onions, peas and carrots. After I take the egg white bites out of the oven, I prepare some chicken breasts and put them into the oven. Once the asparagus comes out, I roll them in sliced chicken or turkey meat for snacks. I also cut up some celery to eat with peanut butter. I put all of these items together in containers and put them in the fridge. Prepping for school lunches is super easy. I put the egg white bites in the microwave to warm up while I put my lunch together. I put my lunch plate in first, then an iced tea and a sparkling water, I still drink my diet coke, but I bring the smallest can I can get and only one per day. I also throw in either cottage cheese or yogurt for my mid-morning snack. I top it all off with an afternoon snack choice of the turkey rolled asparagus or celery/peanut butter and some Yakult. Yakult is a nonfat probiotic that gives your stomach enzymes to help keep it balanced. I do think it is helping with my digestive issues. 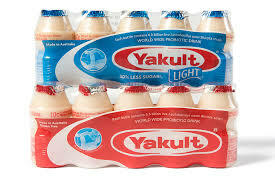 I drink the light Yakult because it has less sugar. Usually, my egg white bites are ready to go by this point. I grab all my stuff, get in the car and zoom off to work. I eat my egg white bites along the way. I think it’s best to lose the weight S-L-O-W-L-Y. I wasn’t really ready for how fast my body shrank the last time. And I was not making this a lifestyle choice. I was just “Following the Damn Instructions” like a robot. This way, I feel more in control. And any time a cupcake walks into my classroom, my students KNOW that I’m not going to eat it myself. I’m going to give it to one of them. Another good thing…I’m not coughing as much anymore. I do a bit at night, but I’m SO much better. I actually feel more like I could start exercising now. When you cough all day, you are exhausted by the time you get a few moments to yourself. So, you just crash on your bed until you fall asleep. My self discipline is still not what it needs to be. But it has improved. I still go through the drive-though window, but I am more apt to get a large iced tea with lemon than I used to. I do order French fries, sometimes, but its more like once a week than once a day. If I can get my drive though addiction under control, I’ll have a lot more money to do other things like put a down payment on a house. My landlord does not want to sell this house, so I’m going to have to move at some point. 1) Avoid temptation. The Talmud (Sanhedrin 107a) advises: For things you find hard to resist, avoid situations that challenge your self-control. If you’re on a diet, don’t visit the bakery. We all make mistakes and the risk of failure is not worth it. God will send enough challenges without needing to tempt ourselves. My students really seemed to enjoy the health unit we just finished. We made posters of healthy choices. I liked this poster in particular as it pushes us to exercise. Exercise and overall strength allows one to feel and know that if the bullies of the world come calling, we have the physical strength to deal with them. Our culminating activity was doing Jazzercize in the school cafeteria. I did enjoy dancing to the music. Maybe I should find more dancing opportunities to exercise to?! **The excerpts from Rabbi Shragra Simmon’s article Discipline the Power of Restraint can be found in the Middot Series #3 on the website Aish.com.